I thrift in two ways. One is that I think VERY specifically about what I’m looking for (usually project related, sometimes just a fashion issue) and it is frightening how often I find exactly that thing. The other is just a random trip for the inspiring thrill of the hunt. 50/50 success rate. Yesterday I went to score cheap old tshirts to make another dress. 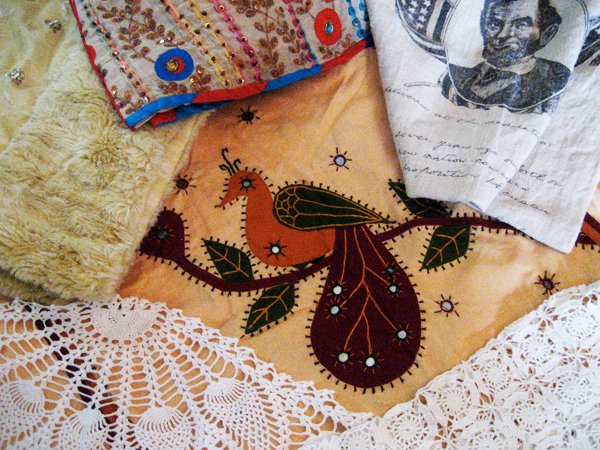 Didn’t happen due to an overwhelming number of ridiculously gorgeous textiles lurking about. Top of the post, the whole score. 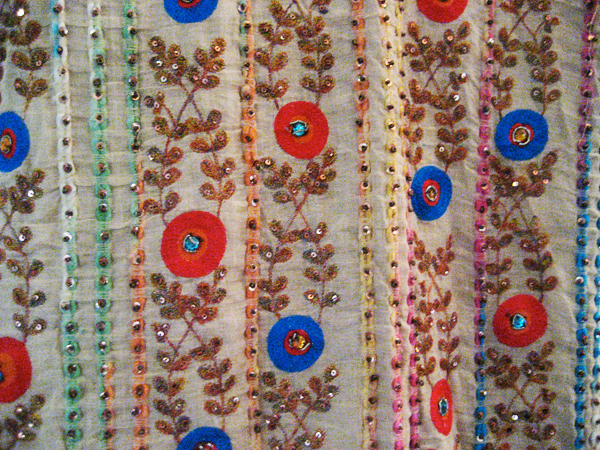 Above, a set of pillowcases (India) with amazing mirrored handwork on both sides of each, total of FOUR panels. Katie, Bethy, Dorie… one each for you local craftistas. 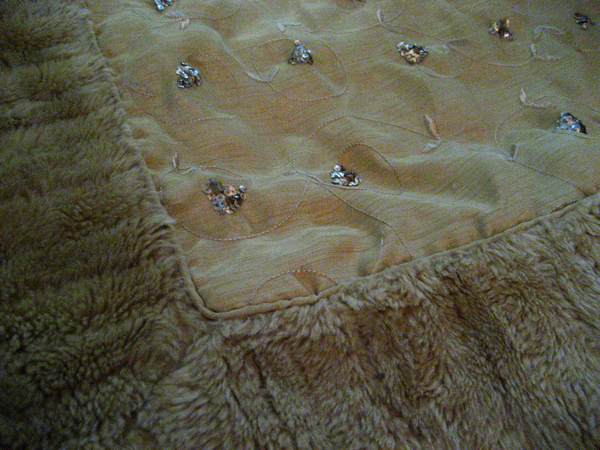 This blanket (India) is the most amazing shade of yellow-maize with faux fur and sequiny embroidery. Anthropologie eat your effing heart out. Wish I had skills to make a coat, but I’m going to do a skirt. Seems weird, hopefully will work. There’s lots of yardage. 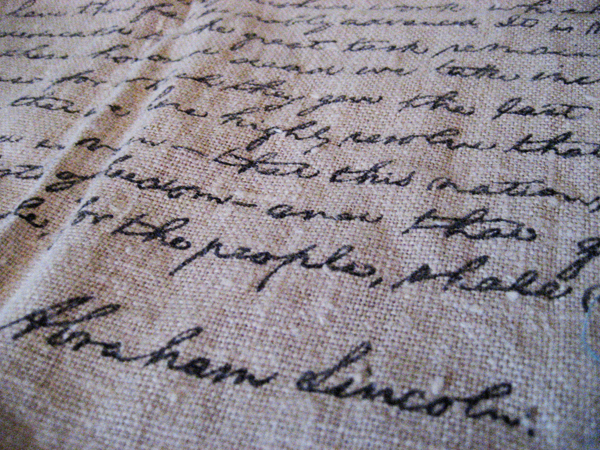 Above, The Gettysburg Address, in its entirety, printed on a scratchy burlap tea-towel sorta thing. LOVE this typography and can’t wait to use patches of it on garments. 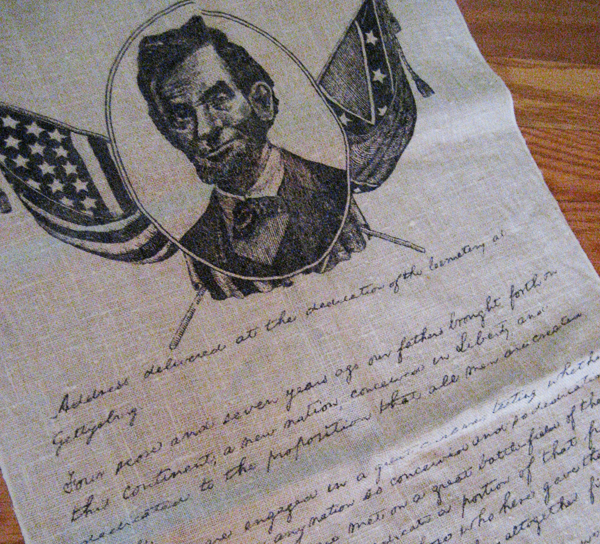 Have to research if it’s an image of Abe’s handwriting (as I suspect). I thought the Lincoln portrait was a bit tacky, but it’s grown on me and might get incorporated somewhere. Warning: This one’s gonna make you swoon. 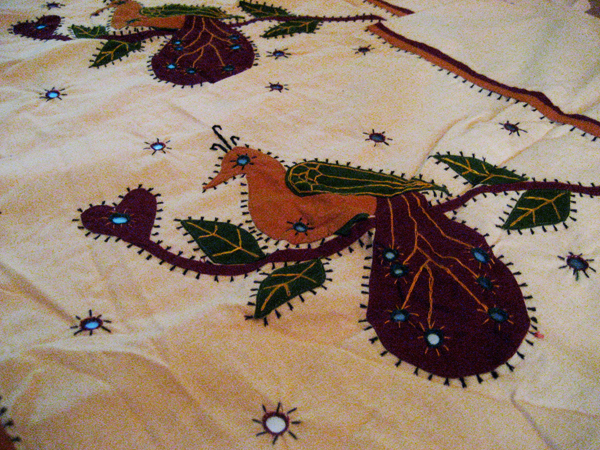 This vintage Indian garment fits me, but is a bit shapeless. I do not have it in me to cut this; yes I have boundaries. 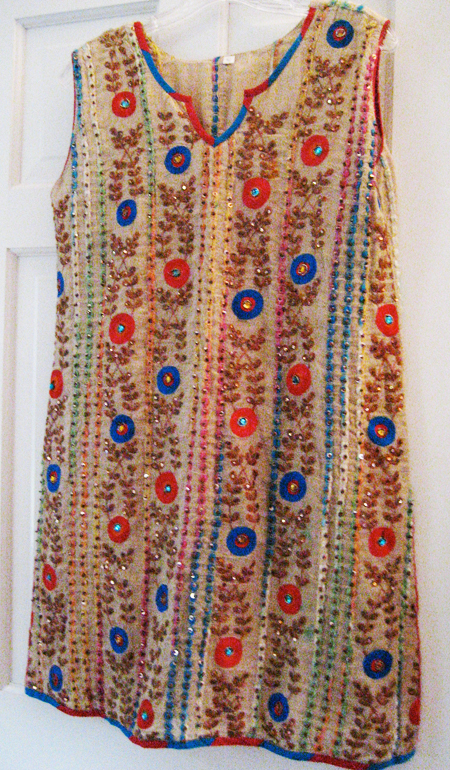 So, if I can’t easily alter it into a flattering shape by taking in the side seams, it will just hang on my wall. Isn’t it divine???? 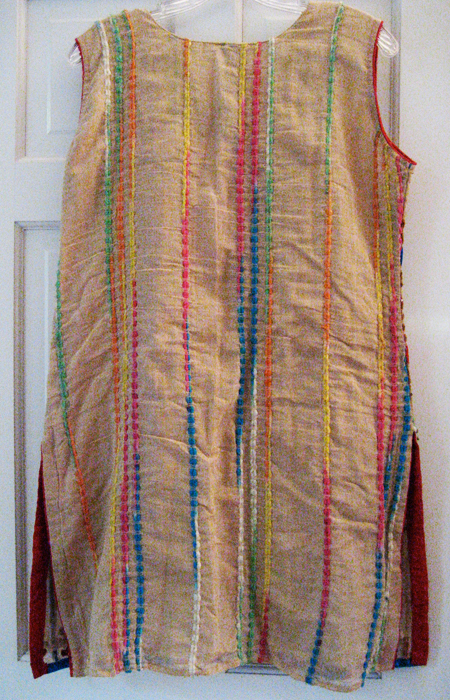 The back, though plainer, is also lovely, with rainbow thread embroidery on this incredible gauzy layered base fabric. This piece was $5, less 25% but is priceless. 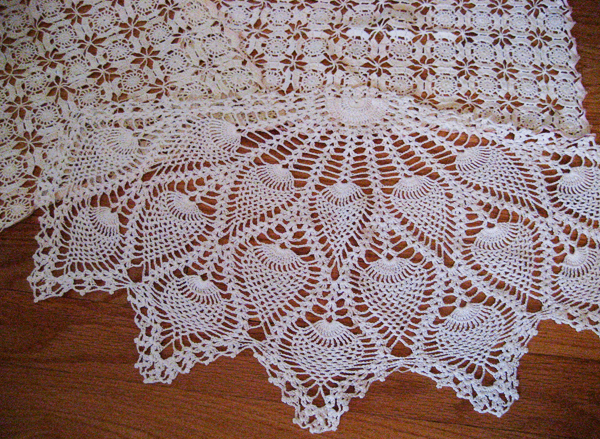 There are often great curtains, linens, and doilies but I try not to over-collect hoard them. You might hear me muttering: Someone else’s treasure… my anti-hoarding mantra. At $1.49, could not pass these up. BTW, the one at the bottom is a “pineapple” pattern. Sweet!